On Wednesday, a wiggly busload of pint-sized angels, ladybugs, superheroes, pirates, fairies and firefighters filed through the front doors at OMRF. Their mission? To rake in Halloween treats, play some games and have a spooky good time. 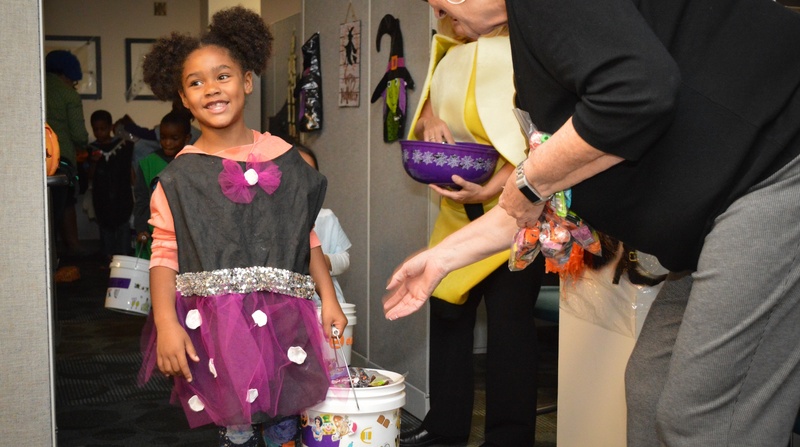 For the 12th consecutive year, OMRF hosted a Halloween event for nearly 70 trick-or-treaters from Positive Tomorrows, Oklahoma City’s only elementary school and social service agency specifically serving children and families experiencing homelessness. To prepare for their young visitors, OMRF administrative staff adorned offices and hallways with spider webs and scary movie-worthy décor. Then they dimmed the lights, turned on eerie music and waited, ready to distribute heaping bowls of candy and small toys. Some employees donned Halloween costumes themselves as they passed out treats to the tiny trick-or-treaters parading door-to-door through the halls. Outfitted in costumes created by students at Oklahoma City University’s Ann Lacy School of Dance and Arts Management, the children were treated to snacks in the OMRF cafeteria to go with the bags of sweet loot they’d gathered in the halls. Homelessness is a significant problem in Oklahoma, said Durham, with more than 44,000 homeless children in the state. The school takes a three-step approach to addressing the problem by focusing on education, providing family support, and removing barriers such as transportation, hunger and basic needs.